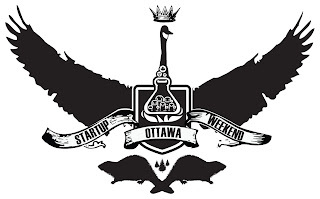 I spent this weekend hanging out in the funky Shopify offices providing advice and support to the teams participating in Startup Weekend Ottawa (SWO). And I had a fantastic time. I've been asked why I don't go back to the startup world since I loved it so much. And my response of late has been, "because that was my life 15 years ago." Fifteen years ago I had the energy, the hunger and -- most importantly -- the time to dedicate my life to my work. But these days, my interests, my priorities, my finances and my availability have changed. Hence my preference for (somewhat) more stable employment in a field I enjoy. But an experience like SWO affords the opportunity to immerse yourself (for a short time) in that exciting startup environment without all the financial (and emotional) risk of actually being in a startup. Especially for me: as a mentor, my involvement was limited to office hours to review the teams' progress and offer them advice, and then I could return home while they worked feverishly into the wee hours. The SWO participants were developers, designers, business people and marketers from local companies who spontaneously formed mini-companies at the beginning of the weekend and spent 54 hours trying to develop viable business ideas. The business ideas varied significantly from hardware solutions to mobile apps, so the questions and input the teams were looking for was just as varied: positioning their idea to attract their target market, design and functionality, storytelling for their final pitches... so many questions! I even had the opportunity to mentor 3 teams based in Hartford, Connecticut (the sister city for this particular event). We met via Google Hangout and chatted about their projects. Surprisingly, the remote mentoring worked just as well as in-person. Maybe even more so since we really felt crunched for time, and focused on their most burning questions. The most challenging part of the experience was delivering the tough love; given the commitment that teams were making and the time they were investing in their ideas, some of them were not receptive to being challenged outright. But that's the mentor role: asking hard questions, challenging assumptions people were making about their target markets or the viability of their ideas, pushing teams to justify how they would monetize their businesses. Some of the participants approached SWO as a hackfest: they wanted to build useful apps and give them away. That approach defeats the entire purpose of Startup Weekend: at the end of the day, businesses are supposed to emerge and get funded. Most of the participants had the right perspective, but it was definitely a challenge dealing with the ones who were more idealistic about their creations. In the end, thankfully, the mentors all delivered the same message: you need to monetize, and the teams came around. My favourite part of the experience was getting to know the teams and watching the evolution of their ideas from the first pitches to the final presentations on Sunday night. Some of the teams disbanded, some of the ideas pivoted completely but all of the final concepts evolved dramatically over the course of the weekend. And some of the products that were built were incredible! From working demos to commercial-ready products, they were incredible! As for me, the one thing I took away from this experience was the realization that all my crazy, varied experience could be put to good use. I mean, how often do you really stop to take stock of your experience and think about how it could be of benefit to other people? It turns out that while my crazy CV can make it hard to get screened in to job competitions, it becomes quite an asset in helping startups figure out app designs, marketing approaches and developing funding pitches. Who knew? If you're at the point in your career where you have a good body of work behind you, and if you love the fast-paced energy of startup environments, you might love participating in an intense mentoring experience like SWO. I hope to have the opportunity to do it again!